Successful Scouts BSA Troops know that having a strong relationship with a Cub Scout Pack practically guarantees an annual transition of youth from the Pack to the Troop. Having a trained Den Chief for every den, particularly Webelos Dens, will help solidify the Pack/Troop relationship and foster a greater awareness and familiarity with your Troop for the Cub Scouts. Den Chief Training helps youth to have a successful experience as mentors for Cub Scouts. Training is conducted in each district annually and may be conducted in conjunction with the Cub Scout Pow Wow. Please refer to the Council calendar for upcoming trainings and additional information. Scouts wishing to become den chiefs will take this online course as part of their training to become a den chief. The module identifies den chief responsibilities and tasks, and describes the den chief’s relationship to the adult den leaders and how that relates to the den chief’s activities with the den. After finishing the online training, den chief candidates print their certificate of completion and undergo further training with their adult den leaders. Estimated time to complete: 45 minutes. Click this On-line training link to begin. A Scout that is serving as a den chief wears the Blue/Gold den chief cord. If serving as a Webelos den chief, they wear the Blue/Gold/Red cord. 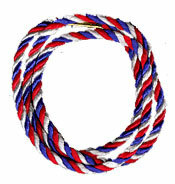 Once he has earned the Den Chief Service award, they can wear the Red/White/Blue den chief award cord. All braids are worn on the left shoulder, under the epaulet and under the arm. It is an outdoor adventure for individual boys based upon the original Scout camp conducted by Lord Baden-Powell in 1907 on Brownsea Island. The methods he tested at this camp became the core of the Scouting program. Individuals are placed into patrols of six to eight Scouts from many different troops who are of varied ages and experience levels. The program is carefully organized and led by a staff of experienced adult Scouters and a youth leadership corps of older Scouts selected because of their experience and dedication. During the week, each Scout will learn the Patrol method, along with the history of Scouting and some of the original games, skills and stories that provided the spark that became the largest youth movement in the world. The program tries to place Scouts in patrols with boys of different abilities, experience levels, and home troops. Part of the experience is making new friends in the patrol and learning how to make a patrol work with this group of “new friends”. Scouts will be able to visit with others from their home troop ;throughout the week. In the Patrol, each Scout has the opportunity to see how the patrol operates by serving in different leadership roles throughout the week. CAN BOYS EARN ADVANCEMENT AT BROWNSEA? Advancement work is not formally a part of the Brownsea program. Throughout the week, boys will be learning skills in nature, rope work, first aid, orienteering and the patrol method. If it is acceptable to the Scoutmaster, boys may have their Patrol Counselor approve Tenderfoot, Second Class and First Class rank requirements completed in the course of the program. They may also go back to the troop and demonstrate the skills they have learned to their Scoutmaster and he can sign them off. IF BROWNSEA DOESN'T EMPHASIZE ADVANCEMENT, WHAT DOES IT TEACH? Brownsea-22 is an experience. The methods of teaching that Baden-Powell suggested are all used in this program; demonstration, practice, and application through games and contests. Advancement is a byproduct of these methods. But more than the teaching of Scout skills, Brownsea provides the Scout with a model patrol and troop experience to share with his home troop; it provides understanding of Scouting’s history; it provides each Scout with an opportunity to practice patrol leadership; it provides teamwork and social development. Furthermore, the adult and youth staff provides valuable role models in terms of Scout Spirit. Scouts should wear the camp uniform (cap, Scout T-shirt, shorts or trousers, socks and shoes…no sandals) during the day and evening activities. The official Scout uniform is required only for evening meals. Scouts will not need a neckerchief. Brownsea-22 is a youth experience, not a parent-son camp. It is not appropriate for parents to “hang around” or volunteer to help out during the week. If parent visits become necessary, they should be arranged in advance with the Brownsea Scoutmaster and Course Director. Visits should also be kept to a minimum amount of time. Gorham Scout Ranch does not have regular phone service. Emergencies may be handled by calling the Council Service Center at (505) 345-8603 or (800) 368-9218 (Monday - Friday 8:00 am to 5:00 pm; Saturday from 9:00 am to 1:00 pm) and after hours Camp Frank Rand at (505) 450-7110 (Emergencies only). Each participant must send a completed Annual BSA Health and Medical Record, parts A, B, and C to the Council Service Center. The medical form can be downloaded here. Please mark the envelope to the attention of Brownsea-22. This is the same form used for summer camp. The physical exam must be current within 12 months signed by a certified and licensed health-care provider with the health history updated at the start of camp. List any medical or dietary restrictions. Upon receiving your application and payment, you will receive an information packet from the Council Service Center. This packet will include a map to camp, a gear list, early arrival details, and other useful information. If you do not receive this packet, please call the Council Service Center at (505) 345-8603 and ask for Mark Yarbrough, the Brownsea 22 Staff Advisor. JLO is a one or two day orientation for Junior Leaders. The course is presented by the troop, a cluster of troops, or by the district. It provides boy leaders with the basic skills needed to carry out their role as a youth leader. Training is conducted in each district annually. Please refer to your district calendar or contact your district executive for more information. Training of the youth leaders of a Troop or Crew is important in helping the individual Scout and the Troop or Crewgrow. The Boy Scouts of America has developed a week-long training experience that has proven very valuable in the training of youth leaders. The Great Southwest Council offers this NYLT Course on an annual basis at Gorham Scout Ranch (aka Camp Frank Rand) near Chimayo, New Mexico. The course will stress two areas of benefit to youth leaders: (1) outdoor living skills and how they can be passed on to the other members of the troop and patrol, and (2) the skills of leadership that will make the youth leader more effective in his job. National Youth Leadership Training is a six-day outdoor experience for youth leaders. It supports the Scoutmaster’s responsibility to train a Troop’s youth leaders. Participants sleep in tents, prepare their own meals by patrols, learn life skills, and live by the Scout Oath and Law. The course stresses two areas that benefit youth leaders: (1) outdoor living skills and exciting ways to share them with other members of the troop and patrol, and (2) leadership skills that make the scout a more effective team member and leader throughout his life. Serving as, or likely to serve as a Patrol Leader, Assistant Senior Patrol Leader, or Senior Patrol Leader. The Scout should also have a strong personal desire to attend the course. Is the home troop Scoutmaster involved? The course is intended to strengthen the relationship between the youth leader and his Scoutmaster. On Friday of othe course, at Gorham Scout Ranch, a special session will be conducted for Scoutmasters on how to work with youth leaders in utilizing their new skills. More information will be sent directly to Scoutmasters of participants. Are any other forms or special equipment required? An equipment list will be sent to each participant with his course confirmation in April. Most Scouts participating in an active troop with a good outdoor program should have the necessary gear. There are no special uniform requirements, but each participant should bring the official Scout uniform (Class A), and ensure that badges are properly placed and that the Scout uniform is worn correctly. Each participant must submit a Personal Health and Medical Record (NEW FORM) at the council service center. This is the same medical form required for summer camp; one will be included with the participant packet. They are also available from this website. Additional information and registration forms can be obtained from Course Director Bill Brennan at brennanb@cableone.net.